Rosa Maria Marques teaches political economy at the Pontifícia Universidade Católica de São Paulo. Paulo Nakatani teaches economics and social policy at the Federal University of Espírito Santo. Analyzing the Brazilian economy is a difficult and complex task; the current indicators register results ranging from excellent to mediocre and worrisome, depending on the variable observed. For example, the nation has advanced into modernity in a few sectors, while at the same time, in recent years, new forms of dependency from the center of capitalism deepened. Further complexities arise when, beyond the economy, one takes into consideration not only the results of so-called “inclusion” policies and the popularity of President Dilma Rousseff (popularly referred to as “Dilma”), but also the number of strikes and public displays of disenchantment that are emerging in every corner of the country. To summarize some of the conclusions: since the government of Luis Inácio Lula da Silva (“Lula”), the Brazilian economy has widened its internal market through policies that have raised the minimal wage, transferred income to the poorest within the nation, increased the availability of credit to the low and middle segments of the population, and reduced taxation (mainly on manufactured goods in the essential consumption basket). Such widening of the market, with a low impact on imports, would in theory ensure the maintenance of a certain level of growth, regardless of the international dynamics, and, indeed, it has helped Brazil reach a positive economic performance during the worst of the recent global economic crisis and its aftermath. The results of the policies of consumption and production stimuli produced a considerable growth of the GDP. Nonetheless, when the impacts of the global recession deepened with the sovereign debt crisis in Europe, these macroeconomic policies did not yield the same effect, at most achieving modest growth. The maintenance of floating (market-driven) exchange rates and the priority of obtaining a high primary fiscal surplus and low inflation—the main components of the economic policy adopted by both governments under Fernando Henrique Cardoso—turned the country into one of the main centers attracting foreign funds seeking high returns.1 These money flows from abroad handicapped Brazil’s international position, pressuring the currency rate upwards and ensuring the permanence of high interest rates. The result was a persistent deterioration in the current account of its balance of payments, which peaked in December 2013. With respect to the trade balance, besides the unfavorable exchange rate, there was a shift to greater specialization in the export of primary commodities, especially where demand was most inelastic, such as soybeans. Last, the priority of setting low inflation targets keeps the government hostage to financial capital’s interests: any elevation in prices brings back the ghost of hyperinflation, and pressures of all kinds arise to increase basic interest rates. In other words, the rigidity imposed by the inflation targets surrenders monetary policy to the interests of interest-bearing capital, mainly composed of foreign capital searching for greater returns in Brazil. The result of all of these factors in the past few years upon the Brazilian economy was a reduction in growth, even though the level of unemployment is the lowest ever observed and the income from labor is still growing, albeit at a decreasing rate. The impression one has is that the governments of Lula and Dilma exhausted their leeway associated with the expansion of the internal market. That is, the choice of widening the internal market (the consumption component) by aiding those with low and middle incomes, while also leaving unaltered the institutions introduced by neoliberalism in the 1990s, has now reached its limit. It is clear that the priority of big capital is not to enlarge the level of productive investment, as long as elevated financial returns are ensured. It is in the middle of this that the nation hosting the 2014 World Cup has been experiencing a new phenomenon since June 2013—manifestations (demonstrations) and protests in the major cities of the country. Although the manifestations occurring today cannot be compared to those of 2013 in quantitative terms, they still continue to be held by the youth, who have no connection to unions and traditional political parties. More recent working-class demonstrations have been directed at questioning the use of public resources in the “arena”—that is, the soccer stadium—of the world football championship, while financing in the areas of education and health goes wanting. Nonetheless, the popularity of the president resumed its growth to a point where she won, though by a reduced margin, reelection. This paper is divided in two parts. In the first, aspects of Brazilian economy are presented in order to show the most obvious results of the macroeconomic policy of the governments of Lula and Dilma, as well as their contradictions. It is not the aim to exhaust the theme, but highlight some important features. In the second part, the constant increase in the fragility of the Brazilian economy, in the face of the inflow of foreign capital, is analyzed, mostly considering the growth in so-called fictitious capital. At the end of the essay, some important conclusions are drawn. Furthermore, the government has legally reduced or eliminated the taxation of goods and services on the basic consumption basket of workers, which also acts to widen consumption. But in the case of the automobile and home appliance industries, the motivation was first to help producers to get rid of stock and second to decrease idle capacity. The tax waiver on industrialized goods was brought to an end at the end of July 2013. With regard to the interest rate, which was always one of the highest in the world, the Dilma government, after elevating the basic rate fixed by the Committee of Monetary Policy in its first few months in office (reaching 12.5 percent in July 2011), kept its level at of 7.25 percent between October 2012 and March 2013, when once again it started increasing.15 In March 2014, the base rate sat at 10.75 percent, and there is no likelihood of a decline in the near future. The resumption of the increase in the basic rate was highly influenced by the action of the big corporate media, which emphasized on a daily basis that the inflation targets were being surpassed due to growing demand. In the end, in no year was the target fulfilled. In reality, under Dilma in particular, it became clear that the power of interest-bearing capital, whether national or international, does not accept declining returns on its assets. The massive inflow of dollars entering the nation has exercised pressure on the currency rate, which has been kept overvalued due to efforts of the government, either intervening in the market or relaxing the rules for exporters (allowing them to keep dollars abroad for a certain amount of time). The result of the fall in the exchange rate has been the reduction of the balance of trade surplus (from $29.8 billion in 2011, to $19.4 billion in 2012 and only $2.6 billion in 2013) and the growth in negative results in the current account. The deficit in the current account of the balance of payments, which in 2012 amounted $54 billion, has jumped to $83.1 billion in 2013 (3.7 percent of GDP, the worst result since 2001). This result contributed to the weak performance of the trade balance, even though the deficit in the services and income accounts has increased compared to the previous year. In Brazil, the presence of foreign capital has always been remarkable, especially in industrial activities. This presence is the result of the option adopted in the 1950s to promote the process of import substitution based on the triangle formed by state capital, internal capital, and foreign capital, which continued in the following decades. From the 1990s onwards, starting in the Fernando Collor de Mello government, a series of measures further changed the Brazilian economy in the international market and promoted the intensification of the presence of foreign capital in the nation, both in productive and financial spheres. Apart from the process of de-statization, brought to fruition by the National Plan of De-statization, which resulted in the privatization of companies previously considered strategic to the national development, the opening of commercial and financial trade with the rest of the world took place. The process of privatization in Brazil happened in two accelerated periods: 1990–1994 and 1995–2002, during waves of global financialization.20 In the first period, comprising the governments of presidents Collor and Itamar Franco, thirty-three companies were privatized, with particular emphasis on steel (64 percent) and petrochemicals (22 percent), with revenues of $11.9 billion (a product of the revenue of sales and transferred debt). In the second period, thirty-five companies were handed over to the private segment sector, among which was Companhia Vale do Rio Doce (a large metals and mining company), adding up to $93.42 billion in total revenue.21 In this second period, beyond the already mentioned sectors, concessions were made in electricity, financial services, transport, roads, sanitation, ports, and telecommunication. In this later phase, the enterprises affected were in infrastructure/services (80 percent: electricity, telecommunications, transport, ports, financial services, gas provision, sanitation, and informatics), industry (14 percent: petrochemicals, petroleum, and mining), and 6 percent in several sectors where the state was a minor stakeholder. With regard to petroleum, Petrobrás (Petróleo Brasileiro SA) is still considered a state-owned company. However, in 2000 a large quantity of stock was put on the national market, exceeding the minimum required for the maintenance of control by the state, and in 2001 preferred (nonvoting) stock was put on the international market. Up until 1994, the presence of foreign investors in the process of privatization was fairly small, not surpassing 5 percent of the revenue from selling the companies. In the second period, however, such participation increased to 53 percent. The greater presence of foreign capital in the process of privatization manifested itself through the increase in foreign direct investment (FDI) in the account of capital and finances in the balance of payments. Between 1994 and 2013, the inflow of net FDI in the country rose from $2 billion to $64 billion.22 In Chart 1, one can clearly see that there were two periods of strong expansion in net FDI: the second phase of privatizations and after 2007. 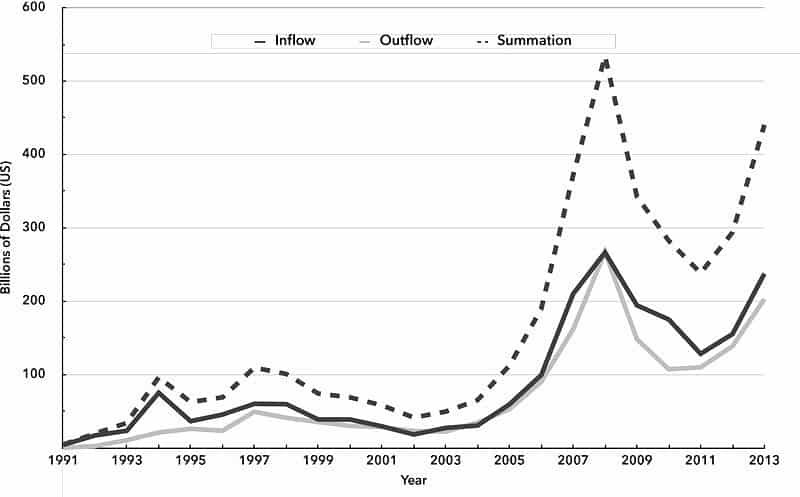 In recent years, with the exception of 2009, the increase in the inflow of net FDI in the nation was a result of the international movement of FDI, when the relative volume destined to developing (or peripheral) countries grew due to the increase in uncertainty in central (rich) nations provoked by the continuity and deepening of the crisis. In 2012, Brazil was the fifth largest destination of FDI in the world, receiving 4.8 percent of resources (in 2006, this percentage had been 1.7 percent).23 The net flow of FDI entering Brazil is divided for tax purposes into the division of the flow of net FDI between equity participation and intercompany loans (loans of the multinational corporation headquartered outside Brazil to its subsidiaries inside the country). 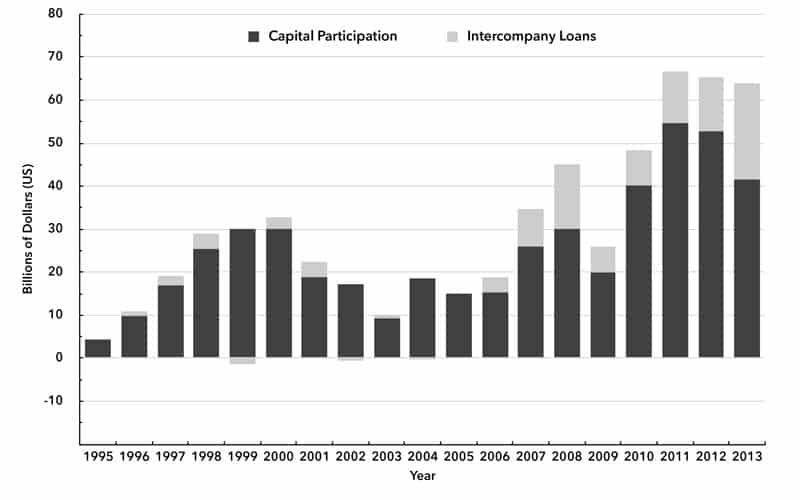 The share of the participation of loans has increased in recent years, motivated by the difference between the internal and external interest rate, especially that of the United States. The inflow of net FDI resulted in a total stock of FDI at the end of 2012 of $719 billion.24 Between 1995 ($41.4 billion) and 2012, the stock increased more than seventeen times! As mentioned before, the first strong impulse to this greater presence of foreign capital in the country was the privatization promoted in the Brazilian economy after 1990. In 2012, the sector of activity that had received the most FDI—participation in capital—was services (51.9 percent), followed by industry (36.7 percent), and agriculture, livestock, and mineral extraction (10.8 percent).26 In services, the largest inflow was for activities in commerce, financial services and related activities, and insurance (pension schemes and health care insurance). In industry, metallurgy, food, and chemicals were the most relevant sectors. In agriculture, livestock, and mineral extraction, the activity that received the most FDI was, by far (56.3 percent), extraction of petroleum and natural gas. Fifteen years before, in 1995, the FDI destination by sector was: 66.9 percent to industry, 30.9 percent to services, and 2.2 percent to agriculture, livestock, and mineral extraction. The significant increase of the latter two destinations reflects the process of privatization and “foreignization” of the services of telecommunication, bank systems, and mineral extraction experienced in Brazil—as well as an increasing participation of foreign capital in agribusiness. In 1991, Resolution 1832 from the National Monetary Board added to Resolution 1289/87 Annex IV, which allows foreign capital to enter the stock market and invest in portfolio and funds in Brazil. Between that year and 2013, the net volume of foreign capital in portfolio increased by 334.2 percent.28 However, as this kind of capital is extremely volatile, more important than this indicator is following the volume of inflow and outflow in each year, which can be observed in Chart 2. In 2008, the daily movement accounted for $2 billion. Chart 2 follows the volatility of this kind of capital and shows that, with the exception of a few years, the outflow movement is a shadow of the inflow movement, indicating that operations happen in the secondary market, consisting of speculative or fictitious capital. This indicates the highly speculative nature of these capital movements. Of the inflow volume in 2012, 79 percent and 21 percent, were destined to the purchase of Brazilian companies’ stock and short- and long-term fixed-income securities, respectively. Even though the balance between inflow and outflow is small, the aggregate accumulated amount of capital in the short run invested in stocks and fixed income securities is impressive. According to the Brazilian Central Bank, the statistics regarding the International Investment Position show the stock of such investments amounted to $638.8 billion in 2012, and, up until September 2013, they had fallen to $606.6 billion. The inflow and outflow movement in the derivatives account in the Brazilian balance of payments is not impressive when compared to foreign direct investment or portfolio investment. After reaching the mark of $1,289 million in 2002, it has decreased through time, registering only $125 million in 2012. Nonetheless, in the liabilities in the International Investment Position, the stock (total amount) of derivatives did not suffer any negative impact from the crisis. It went from $1.8 billion in 2007, to $2.5 billion in 2008, to $3.4 billion in 2009, reaching $4.7 billion in 2011. It fell to $3 billion in 2012 and grew back to $4.6 billion in September 2013. Since 2001, the Brazilian Central Bank has been organizing data and information about Brazilian capital abroad. Such capital, which was not very significant at the beginning of the series ($68.6 billion), grew gradually to reach $355.9 billion in 2012. From this total, the greater part was Brazilian direct investment abroad (BDI), representing annually more than 70 percent of the total, with the exception of 2003 and 2010 (66.4 percent and 68.9 percent, respectively). The remainder was intercompany loans. According to statements made to the registry of Brazilian Capital Abroad (CBE in Portuguese), BDI accounted for $266.25 billion in 2012. However, according to another publication—the table called International Investment Position (IIP)—the value was $270.86 billion (2012), increasing to $293 billion in September 2013. Such an increase highlights the fact that segments of the Brazilian economy are rapidly internationalizing. In 2012, 56.9 percent of BDI was in services (financial services—38.2 percent), 18.1 percent in industry (especially metallurgy—6.1 percent, and drinks—4.5 percent) and 25.1 percent in agriculture, livestock, and mineral extraction (metallic minerals extraction—17.3 percent). As to the destination, in that same year, from the total BDI marked for capital participation, only 6.9 percent was directed to countries in Latin America. With respect to intercompany loans, 13.4 percent was destined to the region, Argentina alone holding 7.3 percent. The massive and continued entry of foreign capital in the country since Plano Real, in the form of direct investment, portfolio investment, and derivatives, has been very expensive. The current account in the balance of payment, which was positive in the first years of the Lula government, became negative in 2008 and has accumulated in these past five years a deficit of $288 billion, which offset to 92 percent of the result from the positive trade balance accumulated between 2003 and 2013. The net result in income payments from the current account registers, with rare exceptions, has been an ascending trajectory: from $9 billion registered in 1994, to an impressive $36 billion in 2012, and $40 billion in 2013. From this last value, the majority came from payments of income derived from direct investment, mostly profits and dividends. In the event of the deepening of repercussions from the global crisis in the Brazilian economy, the volume of income payments that leaves the country will speed up, as happened in 2008 and 2009, due to the anticipation of remittances of profits and dividends, which will put pressure on the devaluing of the exchange rate. Furthermore, one must consider that 10 percent or more of stock in a company is enough for foreign investment to be classified as FDI and not portfolio, so that changes in the international scenario may also mean their withdrawal, with a resulting huge devaluation of the Real. However, even without considering this eventuality, the volume of resources flowing in and out of the country on a daily basis is noticeable. The movement in portfolio investment (inflow and outflow) was $238 billion in 2011, went up to $294 billion in 2012, and to $440 billion in 2013. Thus, the daily volume of speculative business, on the Stock Exchange of São Paulo and in Government Securities, grew from $945.6 million in 2011, to $1.17 billion in 2012 and $1.75 billion in 2013. Not without reason does the government strictly monitor the currency market, intervening heavily when the exchange rate gains or losses too much value. After the 2008 crisis, the government had instituted a Tax on Financial Operations (IOF in Portuguese) of 6 percent on foreign economic inflows. But with the pressure from the outflow of such capital, the tax was suppressed in June 2013. As we mentioned before, later in 2013, in a position of exposed frailty, the government started to intervene heavily in the currency market, in an attempt to control the devaluing of the Real. As we saw, the volume of foreign investment that entered the nation in the eighteen months running through the end of 2013 was impressive. The result was increasing liabilities in the International Investment Position (calculated by historical value) or in the Stock of Foreign Investment (calculated by market value). For 2011, the Central Bank estimated that the stock in IIP was $1.5 trillion. This total reached 1.6 trillion in 2012 and was 1.5 trillion in September 2013. From those, the portfolio investments represented around 40 percent, that is, about $600 billion. Besides the explosive growth in external liabilities, another factor that aggravates the situation in Brazil is the enormous volatility of this capital. Beyond the huge volume of daily trade, the variation in trimestral balances puts the Central Bank and the National Treasury in a difficult situation. For instance, at the worst of the crisis, between December 2007 and December 2008, portfolio investments decreased from $508.4 billion to $287.5 billion, a reduction of 43.5 percent in twelve months! In 2013, the fluctuation was significant, since the amount in March accounted for $638.9 billion, dropping to $558.7 billion in June, and increasing again to $606.6 billion in September. A great part of this fluctuation corresponds to the devaluing of the currency, as occurred in the worst of the crisis, and another part may be realization of gains, with the respective repatriation of capital of such gains. Hence, in the case of a deepening of the crisis, the also surprising level of foreign-exchange reserves ($379 billion in July 2014), albeit comfortable, would rapidly decrease, exposing the vulnerability of the Brazilian economy. Nonetheless, the growth in family consumption has lost momentum in the past few years, which does not mean it cannot be widened further. But this enlargement would require another kind of policy, not those adopted by the Lula and Dilma governments. The option adopted implied an improvement in the distribution of income among working people, but did not alter the relationship between capital and labor, as media reports of the results of companies and banks demonstrate. From the side of investment, in spite of the improvement registered in 2013, there are problems looming on the near horizon, driven by the non-resolution of the European crisis, the weak performance of the U.S. economy, and the economic situation of Argentina, the main Mercosul partner. These problems are likely to be sufficient to inhibit certain types of products as well as to create an internal climate of uncertainty with regard to the future. To this one must add the policy of large fiscal surpluses, inhibiting the capacity of the government to invest, even in projects attached to the strategy of Public-Private Partnerships. But perhaps the greatest frailty to which the Brazilian economy is exposed derives from the openness to the inflow of foreign capital. Such inflow, largely a result of the enormous liquidity injected in the global economy by the United States in recent years, has been promoted in Brazil, since the 1990s, by the enactment of a series of measures that benefited (particularly fictitious) interest-bearing capital, be it national or international. In the case of international capital, its massive and uncontrolled entry into the country, both in the forms of FDI and portfolio and derivative investments, holds the nation hostage to market mood swings, U.S. interest rate policy, and the strategies of the companies bringing in resources. In 2013, it was enough for the U.S. Federal Reserve to speak of changes in U.S. monetary policy for a large volume of capital to leave Brazil. In such a situation, in spite of all efforts, the government cannot control the exchange rate, which thus remains overvalued. And it is indeed this same capital, along with its domestic counterparts, that puts pressure on the state to maintain high interest rates, regardless of the fact that these elevate the costs of the three government spheres—federal, state, and municipal. The increase in internal debt, together with primary surpluses, inhibits the State from making public investments and funding social programs, which are, after all, its responsibility. ↩Current government expenditures, excluding interest on government debt, are less than tax revenues. There can be a primary surplus but an overall deficit if total government spending, including interest payments, is more than tax revenues. ↩The system of concessions was switched by the shared production model. In the first model, the companies hold the oil and the state receives royalties, special participation and signing bonus (at the time of the signature of exploitation contract, value decided by auction). In the second, the state has some part of the production and the companies receive in oil the cost of exploitation and a part of the difference between the production and the cost of exploitation. ↩Carla Simoes and Mario Sergio Lima, “Brazil 2015 Primary Surplus Target Wider Than 2014, Budget Shows,” Bloomberg Business , August 28, 2014, http://bloomberg.com. ↩ Alfredo Saad-Filho, “Brazil: The Debacle of the PT,” The Bullet , March 30, 2015, http://socialistproject.ca. ↩World Bank Data, “GDP Per Capita Growth (Annual %),” accessed March 19, 2015, http://data.worldbank.org/indicator. ↩This series, calculated by the Brazilian Institute of Geography and Statistics (IBGE), comprises the six main metropolitan regions of the country: Recife, Salvador, Belo Horizonte, Rio de Janeiro, São Paulo, and Porto Alegre. The institution is starting a new series, incorporating another 3,000 medium-sized cities. It is expected that the level of observed unemployment will rise with this new methodology. See IBGE, Síntese de indicadores sociais (Rio de Janeiro: IBGE, 2014), http://www.ibge.gov.br. ↩Workers under formal employment are ensured legal rights and social protection. ↩Departamento Intersindical de Estatística e Estudos Sócioeconômicos (DIEESE), “Política de valorização do salário mínimo: valor para 2014 será de R$ 724,00,” Nota Técnica , no. 132, December, 2013, http://2013.cut.org.br. ↩Sergei Soares, Pedro H. G. Ferreira, Rafael Guerreiro, and Fernando G. Silveira, “Os impactos do benefício do Programa Bolsa Família,” in Jorge A. de Castro and Lucia Modesto, Bolsa Família 2003–2010: avanços e desafios , vol. 2 (Brasília: Ipea, 2010). ↩In 2013, the market share of the automobile industry reached 18.2 percent of the GDP. “In December 2003, the Brazilian Congress passed new legislation regulating the legal status of payroll lending, which consists of personal loans for which the principal and interest payments are directly deducted from the borrower’s payroll check.” Christiano A. Coelho, João M.P. de Mello, and Bruno Funchal, “The Brazilian Payroll Lending Experiment,” Review of Economics and Statistics 94, no. 4 (November 2012): 925–34. ↩The resources of banks are divided into two parts, with interest rates subsidized by the government and with rates set freely by banks. In May 2014, these fees amounted to an average of 23 percent for businesses and 42.5 percent per year for families. These loans with free resources represented 54 percent and the subsidized loans represented 46 percent. For the 14.5 percent of the GDP figure, see Notas Econômico Financeiras para a imprensa, several years, http://www.bcb.gov.br/?ECOIMPRENSA . ↩Banco Central do Brasil, Censo de Capitais Estrangeiros no País, 2011 , http://www.bcb.gov.br/?CENSOCE. ↩These rates are targets set by COPOM; the effective market rate, SELIC, is slightly different, calculated as the “mean of the daily interest rate, annualized based on 252 working days” (http://bcb.gov.br/Pec/Copom/Port/taxaSelic.asp#notas). This reached 12.42 percent in July 2011, then varied between 7.14 percent and 7.16 percent in the period of lowest value, and amounted for 9.9 percent at the end of 2013—before the last increase promulgated by COPOM. ↩Notas Econômico Financeiras para a imprensa, several years. ↩Brazil, Tesouro Nacional. Relatório Mensal da Dívida Pública Federal. Dezembro de 2013 , Tabelas, http://tesouro.fazenda.gov.br. ↩Sonia Filgueiras, “Perfil da dívida pública preocupa CNC,” Brasil Econômico, 2013. http://brasileconomico.ig.com.br. ↩Luiz G. Belluzo, “As crises cambiais,” Carta Capital , February 5, 2014, 25. ↩During the Lula government, the privatizations did not stop, although they were marginal when compared to the volume privatized previously. Among others, the sectors privatized were federal roads (the winning group was the Spanish OHL), the railway North–South (granted to Vale, formerly Companhia Vale do Rio Doce), banks, hydropower reservoirs, and transmission lines. ↩Companhia Vale do Rio Doce, one of the biggest producers and exporters of steel around the globe, was privatized in May 1997. See Aloysio Biondi, O Brasil privatizado. Um balanço do desmonte do Estado (São Paulo: Perseu Abramo, 2000), and O Brasil privatizado II: o assalto das privatizações continua (São Paulo: Perseu Abramo, 2003). Both books can be downloaded for free at http://novo.fpabramo.org.br. ↩Net FDI deducts outflows of foreign investment in the participation of capital and the debts relative to intercompany loans. ↩United Nations Conference on Trade and Development (UNCTAD), World Investment Report 2013 (Geneva: United Nations, 2013), http://unctad.org. ↩Banco Central do Brasil, Boletim do Banco Central–Relatório 2012 , 113, http://bcb.gov.br. ↩The remaining 0.06 necessary for 100 percent refers to Acquisition and Sale of Real Estate. ↩KPMG Corporate Finance, Pesquisa de Fusões & Aquisições–transações realizadas no Brasil , several years, http://kpmg.com. ↩Defined as the result of inflow and outflow of foreign capital in portfolio. ↩Folha de São Paulo, “BC leiloará US$ 54,5 bi até o fim do ano para tentar frear alta do dólar,” August 23, 2013, http://www1.folha.uol.com.br. ↩Banco Central do Brasil, Taxas de câmbio, 2014 , http://bcb.gov.br. ↩Myles Horton, The Long Haul (New York: Doubleday, 1990), 84.